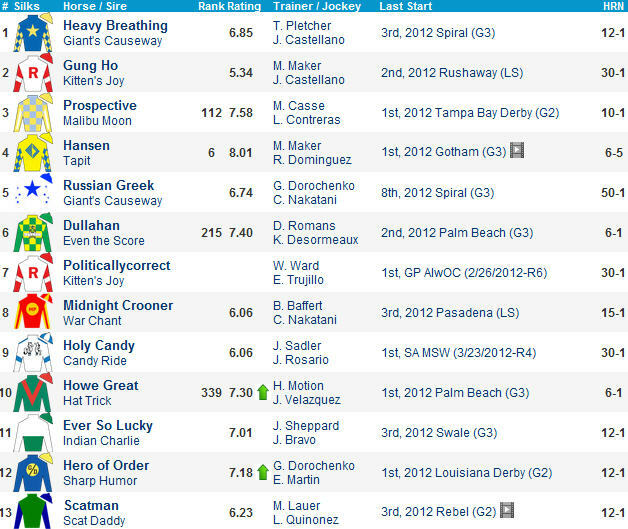 Santa Anita Derby 2012 Preview – Creative Cause a slam dunk? Southern California’s top Kentucky Derby 2012 contender Creative Cause is the strong 6-5 morning line favorite in Saturday’s Grade 1 Santa Anita Derby. Is he worth trying to beat in Santa Anita Park’s showcase event? #1 Creative Cause (6-5) has been a major Derby top ten player since I began my list last September and he continues to go strong for trainer Mike Harrington. The tactical gem of consistency removes the hood and the only weakness he has is losing focus and goofing around in the stretch. He qualified for the Kentucky Derby on graded earnings long ago and does not need to win this. The main thing is to keep his mind on business and finish up strong with a quality top three performance. #8 Midnight Transfer (10-1) is capable of giving the aforementioned favorite a scare if he improves off his San Felipe show finish. He is training well for this and has the numbers to make a dent if he handles today’s added ground. Not sure he really wants to go this far but he projects a decent tactical trip under new rider Mike Smith and the price figures to be right. #2 Liaison (8-1) capped off a productive juvenile season with a game win in the G1 CashCall Futurity but everything has gone wrong this year. He clipped heels and fell in the G2 Robert Lewis and got no pace help in G2 San Felipe 4th place effort. He reunites with winning pilot Bejarano and should offer value. #4 I’ll Have Another (5-2) surprised off the shelf in the G2 Robert Lewis at 43-1 but that race has not been productive and he offers no value at 5-2. The fresh colt is an early-pressing player at the very least. #5 Longview Drive (12-1) is 0-for-3 in the graded ranks and will probably be aggressively handled by Russell Baze, who rides him well. #3 Holy Candy (8-1) makes his third start in five weeks for Sadler. The promising son of Candy Ride looked good in local flat mile graduation run March 23 but he shows up in a tough spot and is light on numbers. Does Drew Brees have a Kentucky Derby horse? #10 Brother Francis (20-1) is a stakes placed maiden trying to make the Derby cut. He does not have the numbers to win but another minor award is not out of the question. Garrett Gomez ends up here. #6 Paynter (6-1) looked good graduating against three rivals at 5.5 furlongs at Santa Anita Feb 18. The Baffert trainee is probably not up to this type of company at this stage but is worth following. #7 Senor Rain (15-1) exits an optional claiming extended sprint tally here and should make his presence felt from the outset. He seems a cut or two below the best in here. #9 Blueskiesnrainbows (20-1) is a Baffert outsider. He removes the hood and should stalk the pace before throwing in the towel.